An independent family builders’ merchant celebrated 50 years with help from Filplastic. The Yorkshire racking specialist helped Branch Bros turn tractors into timber by launching a new depot at Holbeach in Lincolnshire to celebrate its half century. The new location, on Boston Road South, is the former premises of Boston Tractors, which served farmers in Lincolnshire for many years. Now the newly renovated Branch Bros site is serving the area’s building trade customers and landscapers, as well as local DIY enthusiasts. Ben Callow, Branch Manager of the Holbeach depot, said that maximising use of the space had been the main priority when designing the site, and that is where Filplastic brought a lot of value. He said: “We really wanted to maximise storage and display in the main shop area for customer service and self selection which is why we spoke to Filplastic. They have worked with us before at our other branches. To achieve that, they suggested taller racking in the shop meaning we can store back up stock higher, only bringing it down when the shelves below become low on stock. The premises required significant renovation before work on the inside was able to take place, including structural repairs and re-cladding the roof and insulating the building, and replacing the floor, electrical lighting and heating to name just a few. Now it consists of a trade counter within the main shop area, stores with timber mill, warehouse and a yard for storage and display of building products, aggregates, paving, decking and many other outdoor building and gardening products. Gary Winter, Business Development Manager of Filplastic in the north of England, wished Branch Bros well with the new site, saying it was in a fantastic location in a thriving town. “The Holbeach depot is near the centre of town and has its own parking so it is accessible and convenient for trade and retail customers alike,” he said. “I’m sure it will become very popular. 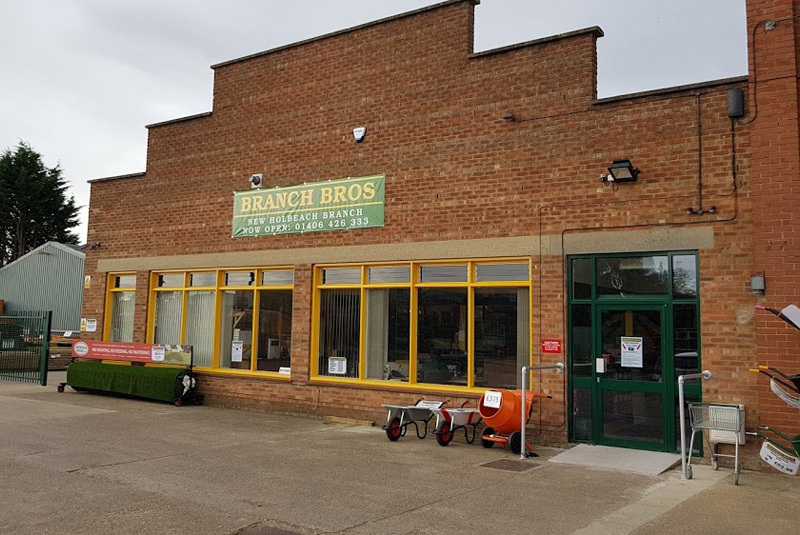 Branch Bros is a third-generation family business which opened its first branch in The Deepings in 1967. The company opened a second branch at Bourne in 1997 after 30 years of trading, and then Holbeach this year to celebrate 50 years of business. All three locations are in South Lincolnshire but cover a wide rural area.